Set off for a day trip that allows you to design your own itinerary, between the sea and the sky! Visit one of France's most iconic sights, the stunning UNESCO World Heritage listed island of Mont Saint Michel and its bay. Discover the magnificent medieval abbey at the island's summit, a historical masterpiece. Take advantage of the opportunity to experience the magic of the island and the breath-taking sight of the Bay of Mont Saint Michel, at the mercy of the tides. 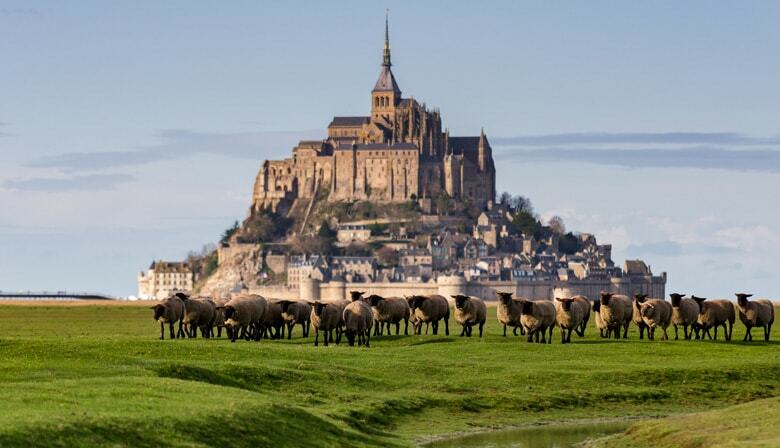 Departure at 7:15am from our office in the center of Paris for an amazing day at Mont-Saint-Michel. Take advantage of the bus journey to admire the beautiful green landscapes paraded before you. As you gaze out onto the Normandy countryside, listen to some initial commentaries on a personal audio guide in the language of your choice. reaching Mont-Saint-Michel around noon. Visit the base of the island of Mont Saint Michel on foot; a unique fortified rocky outcrop, it dates back to the Middle Ages and is surrounded by a vast bay with one of the biggest tides in Europe. You’ll be free to climb up to the summit of the island to the fascinating Benedictine Abbey, dating from the 8th century. Audio guides will introduce you to the history of this church ,dedicated to the Archangel Saint Michael. You’ll also be given an explanation of the construction of this jewel of Gothic architecture, built on three levels. You’ll discover the cloisters, the Abbey's imposing refectory and its authentic garden overlooking the sea. You can tour the site at your own pace, following the ramparts and climbing the perimeter walkway. Your walk through the village will be sprinkled with commentaries on the various points of interest located around the village. Marvel at the breathtaking landscape and take a lungful of real sea air! You’ll be lost in admiration… at the sand stretching away as far as the eye can see at low tide, or the sea surrounding the island at high tide. Flyer with discounts coupons available in a wide choice of restaurants, museums and gifts shops of the group "la Mère Poulard"
The tour guide is very knowledgeable and we enjoyed his guide. I totally recommend this tour. It was very well organised, The guides were charming, amusing and Informative, always willing to help with any questions. The bus was amazing and was the most comfortable bus trip I’ve ever enjoyed. Excellent service and transport to Mont St Michel. Audioguide very informative and clever in audiopen style. I wish there was more time at the end of the tour to explore. But all in all it was a good informative trip. Next time i won’t do the audio guided though. Audio tour was very informative and easy to use.